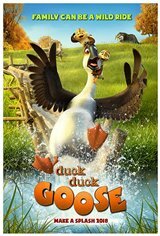 Misfit bachelor goose Peng (Jim Gaffigan) thinks he's better than any of his fellow geese. He does crazy flying stunts and doesn't want to practice for the migration south like the rest of his flock. When one of his stunts goes awry, he winds up hitting a flock of ducklings. In the melee, brother and sister Chao (Lance Lin) and Chi (Zendaya) are separated from the rest of their family. Peng has to step up to the plate to right his wrong and take the ducklings under his wing, no matter how lame a duck they think he is at first.